This crispy, crunchy, and extremely refreshing coleslaw recipe features a very under-utilized vegetable found in almost every large American grocery store's produce section – I'm talking about jicama. In fact, there's a good chance you've never had it, which is a shame. The flavor is very mild, and subtly sweet. It's just perfect for raw salads like this coleslaw, and blends wonderfully with the tart apple and crunchy cabbage. One problem with jicama is how it's marketed. As you'll see in the video, the label described it as, "a Mexican potato," which is just a terrible comparison. If you want to make something sound unappetizing to an American, have them think they are going to be eating something that's like a raw potato. Yum. Jicama does have a similar texture to a raw potato, but that's where that comparison ends. It is a little starchy, but pleasantly so, and each bite produces a mini explosion of juicy goodness. So, don't be afraid! I hope you buy some jicama on your next trip to the market, and give this easy side dish recipe a try soon. Enjoy! Here in Finland I don't that we have jicama. This looks delicious - can't wait to try it. I am a big fan of jicama! I'd love to see a vinegar-based dressing for this coleslaw. Would this do well with walnuts instead of corn nuts? Yes, but only if you like walnuts. This looks so yummy, I can't wait to try it! I just recently discovered your posts and I am really enjoying them a lot. sengkuang! haha that's how jicama is called in malay. just sharing, say it seng-ku-wang! While I am not a huge fan of creamy coleslaw this sounds pretty good. The problem will now be to actually find a jicama in New Brunswick (the Canadian province, not the city in Jersey). Substitutes for jicama on the web include jerusalem artichokes (equally tough to find but with a nice sweetness), water chestnuts, and apple. I would think that a nice sweet little white turnip or a white beet might also prove interesting in the salad. I love jicama! It isn't a potato! That does look texturally exciting... and delicious! I can't wait to try this one! Everything!!! Doesn't jicama last a long time, so that it could be shipped to other countries? We love them on raw veggie plates with dip. I think they're similar in texture to radishes, but without the sorta-hot bite that radishes have. you just brought childhood memories. i love jicama! when we were kids, we'd have that sliced and eat to our hearts delight. sometimes, we would dip it in salt. i'll definitely try this recipe! hope i can find jicama here in germany. i really haven't looked for one. Jicama is soo nice. We'd eat it cold on hot tropical summer days, with just a nice topping of coarse salt. Or shrimp paste. 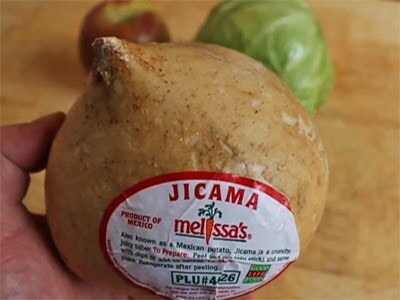 The way you pronounce JICAMA is CORRECT. Please keep pronouncing it like that because JAY-CA-MAH sounds awful and it's not correct at all. By the way, my mother tongue is spanish, so, that's how I know. Do I win a prize if I'm the first (Out of 16 people to comment) to point out that you left the hot sauce out of the dressing recipe? ;-) How about a copy of your cook book???? is it out yet?? My mouth is watering reading this recipe - just bought a jicama yesterday!! Thanks!! I never tried Jicama...will need to look around and see if they sell it here up north. I LOVE Jicama!!! I'm Hispanic & we consider it a fruit. We eat it as a "snack" with lime, salt & chili powder. YUMM!! Saw this video this morning, went shopping this afternoon and made this recipe tonight. It was really good! Thanks Chef John! Ok I made it today; I used purple cabbage and now realize why most slaws only have little bit of purple cabbage - it's much crunchier than regular cabbage (I pay attention to food textures, since DH has old-fashioned dentures). I also bought the wrong apple, I used a granny smith instead, but it tasted good in the slaw (even though I forgot the sugar LOL). I did use cilantro, chopped finely into the dressing. Jicama is called Mengkuang (Malay word) where I come from. We either eat it raw, juice it as a drink or make them into popiah. Popiah is a wrap with cooked mengkuang, prawn, sliced Chinese sausage, sliced hard boiled eggs, chopped peanuts and piece of romaine cabbage). A thin spread of sweet soy sauce with a dash of fresh chillie sauce is laid on the popiah skin before the rest of the ingredients are place on top. It is then roll and folded into a elongated package. Chef John - First I have to tell you that we found you while looking for an aioli recipe and just love you, your recipes and videos. My question is, what was the name of the hot sauce you said you used on this recipe? I tried to google it phonetically but had no luck. I would really like to make this recipe for a picnic my family is having in June. Do I need to do any tinkering of the dressing if I am serving 50 people? Kohlrabi is not a good substitute. Jicama is like a apple without the apple taste. Kohlrabi is closer to a sugar beet or turnip. You would be better off making it with all apples. If I followed this recipe, how many people would you say it will serve? So we had left overs and it was still crunchy the next day and the day after. It help up amazingly well! is there any replacement for pinnapple juice ?? Btw, you are my cooking mentor/guru/teacher. I decided to learn cooking at 59 and so far I have been successful by using your video recipes. No complaints yet and list of acclaims from my biased family. there is nothing like pineapple, but you can use things like lemon or vinegars like regular coleslaw. Hello Chef this look fantastic, and by the way we mexicans love jicama (Your pronunciation is perfect). Greetings from the beautiful and warm Cancun. I have made this salad with shredded raw sweet potato. His dressing in this recipe is original, but very good and I think it is better than the vinegar based one. Also, instead of the corn nuts I use unsalted peanuts, but really any nut is good. I have also adjusted and used granny smith apples at times. I ate this salad a couple of times a week for nearly 3 weeks, since the jicama I bought was so large. (I now know better). Seriously a very good and crisp salad. Jicama? We call it Singkamas in Philippines. Wow. We like to eat it by dipping it with salt...My nana made a singkamas pickle...she called it that way, with some sugar and vinegar which is also delicious. I don't really know if Jicama is the same as singkamas but they're look alike...hmmmm new discovery for me...There is this farm field in front of our house and the farmers there plant this singkamas or jicama(maybe) and my mom bought one plastic of it. I thought it wasn't delicious. But it was. I have lead a sheltered life...what is corn nuts and where do I find them? Found in regular grocery stores. What brand mandolin are you using in the video? I can't decide if a cheap one will do the job well and won't break down or if I need to buy a more expensive one for everyday use. I made this yesterday for our Fourth of July celebration. Turned out great, and got lots of compliments (which actually went to my wife but who's counting?). I went a little light on the Siracha (to keep it kid-friendly) and supplemented with ketchup to attain the pink color but otherwise followed the recipe. Thanks for yet another winner, Chef John! Made this tonight (minus corn nuts, didn't have any) and this was another great recipe from Chef John! The slightly spicy kick on the pallette at the end keeps it interesting and not your everyday coleslaw recipe. In fact, I'm usually not a huge fan of coleslaw but the Jicama and Apple and the unique dressing makes this recipe a stand out among other slaws. I will definitely make this again- great summer salad, so refreshing and light. If you're reading this, try it!